ERIN GO BRAGH! ~~ TOGETHER WITH PALESTINE!! Israel has strongly condemned the decision by a Dublin City Council subcommittee on ceremonies to raise the Palestinian flag over city hall in solidarity with the Palestinian people “who have lived under brutal Israeli occupation.”According to the decision Tuesday, the flag will be raised on May 15th, marking 50 years since the territories of the West Bank and Gaza Strip came under Israeli control. The proposal must pass another round of ratification set for May 8th before it can become an official decision. However, given the council’s composition, the chances are good that the proposal will be passed with a large majority, as it was unanimously approved in the subcommittee. Comments Off on ERIN GO BRAGH! 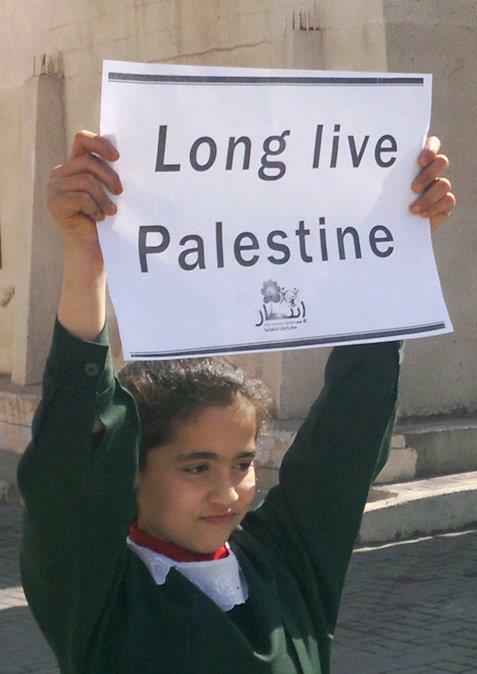 ~~ TOGETHER WITH PALESTINE!! ISRAEL: A PLACE TO VISIT OR BOYCOTT? Hugh demos both in Ireland and New York.. 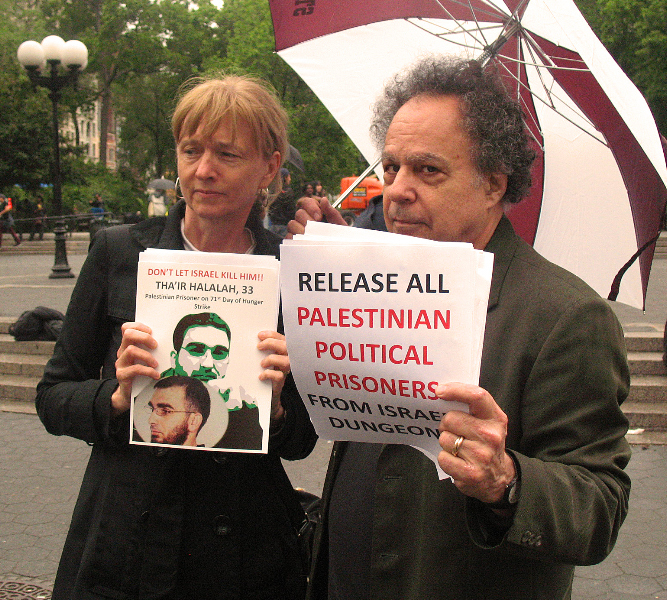 In light of the very critical impending situation of the ongoing hungerstrike by Palestinian prisoners, the Irish Friends of Palestine are currently working to assist the CEPR to gain signatures of Irish TD’s, MP’s and MLA’s throughout Ireland. 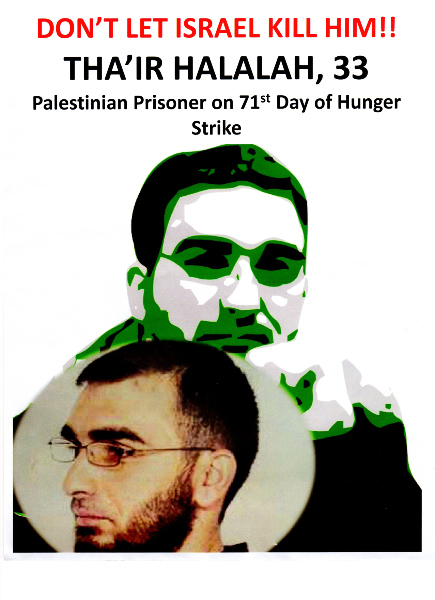 We now have a total of 64 Irish parlimentarians who have signed the petition for the CEPR in support of the Palestinian prisoners on hungerstrike. We are proud to say that in the South of Ireland we have every political party represented, Fianna Fail, Fine Gael, Irish Labour party, Sinn Fein, People Before Profits and Independents. In the North we have 29 Sinn Fein signatures and we hope other parties in the North will also come on board to sign. The petition states the current situation of administrative detention and covers the 4 demands of the prisoners. The petition will also be put to Parlimentarians throughout the European Union. 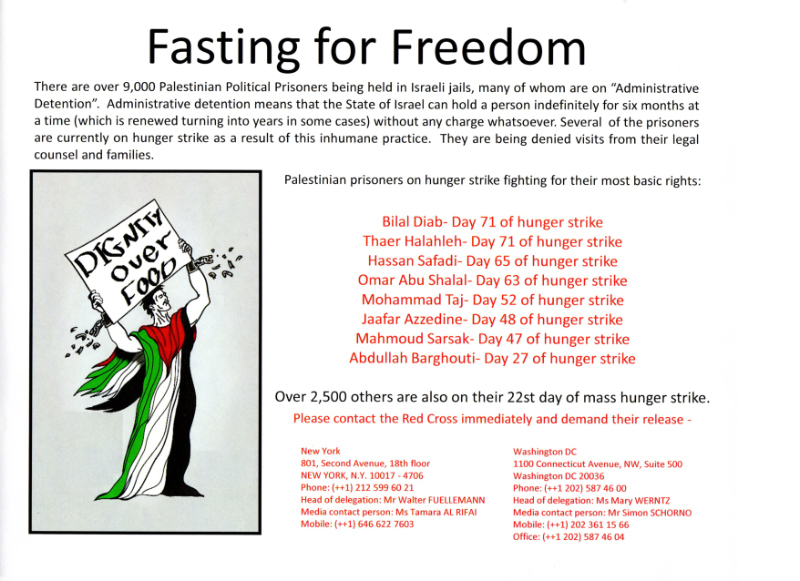 Official figures show that over 1,500 Palestinian Prisoners have embarked on a hunger strike in protest against their conditions and Israel’s use of administrative detention. 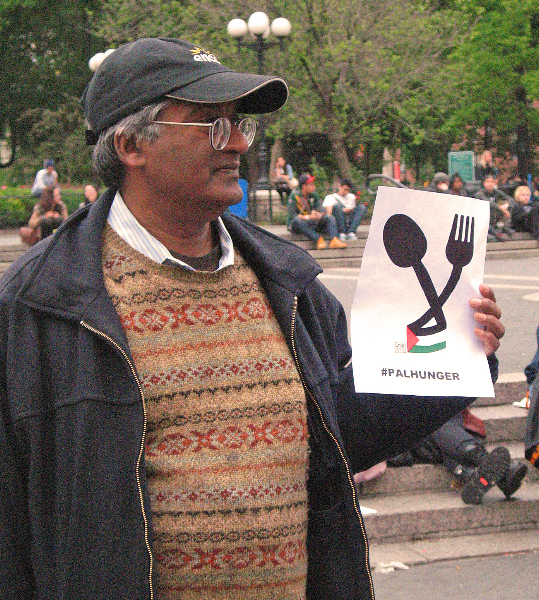 The majority began their protest on April 17th, but there are several who have been without food for much longer. 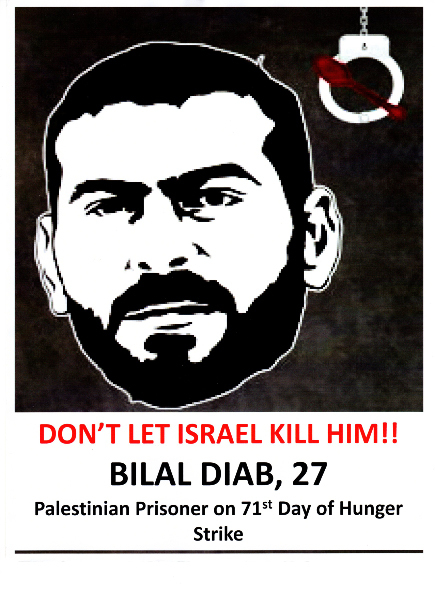 Two individuals, Bilal Diab and Tha’er Halahlah, are in severe medical danger having both been without food for over 70 days. The prisoner support and human rights association, Addameer, states that 20% of the total Palestinian population in the Occupied Palestinian Territories (and as high as 40% of the male population) have been arrested by the Israeli authorities. There are currently 4,500 Palestinian prisoners in Israeli jails, and around 300 of these are being held in administrative detention. Administrative detention is a military practice that allows authorities to indefinitely detain people without charge or trial and without presenting any evidence against them. The conditions imposed on prisoners and detainees are shocking. It is usual for prisoners to be held in solitary confinement and frequently denied visits from their family. Those in solitary confinement are held in a cell no larger than two and a half square metres, and which contains only a mattress and blanket. Detainees are permitted only one hour of sunlight and fresh air per day, and have their legs and hands cuffed during this time. 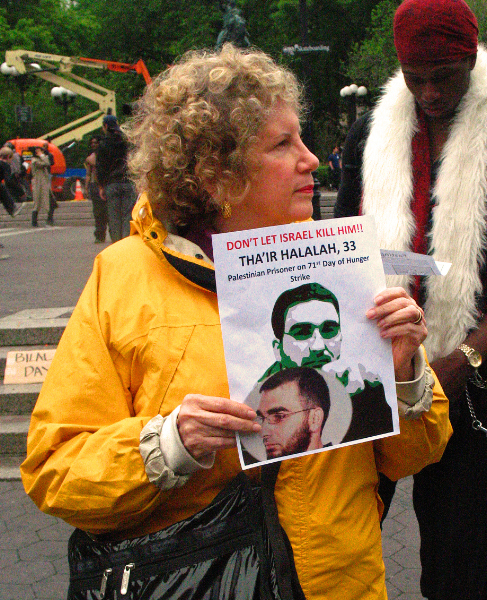 In one of the most reported cases, Abdullah Barghouti has spent nine years in solitary confinement. 1) That International Law and its provisions with regard to administrative detention are respected.2) That Israel ends its policy of administrative detention. 3) That Israel ends its policy of keeping prisoners in solitary confinement.4) That prisoners are allowed to see their families. As you stand on the balcony and look across the darkness, the most amazing fact will hit you, as you stand there in Gaza and look across the water, you can, within a matter of minutes see the entire desperate sad story of Palestine encapsulated into one glance across the ocean. Once, long ago, Jews, Christians and Muslims lived side by side in the land across the water, before Zionism took control of the Jewish religion and the region. For as I stood in the darkness on the balcony in Gaza and I cast my gaze across the water, I can see lights, millions and millions of lights twinkling in abundance. So what was once part of Palestine, it is lit up like a giant Christmas tree or Disney Land in the distance, welcoming the world to the now Jewish State as the people of Gaza suffer with candles in the darkness. This is the story of the “haves” and the “have nots” the occupiers and the occupied, the land stealers on one side, and on the other side in the darkness, those with the keys still in their hands. The first (of many more) Freedom & Friendship Irish Delegation to Gaza was a big success, we covered so much. As an organiser of the delegation, I think we delivered for our members an experience they wont soon forget. As we all begin to attempt to settle back into “normal” life, bits and pieces of the long trip begin to find their places in my memory. We will, of course, eventually post reports on all the meetings we had with various Universities, NGO’s, Schools, and the main political parties. But I first want to tell our supporters about the frustration and anger of the experience. Israel only allows 6 hours of electricity within each 24 hours. 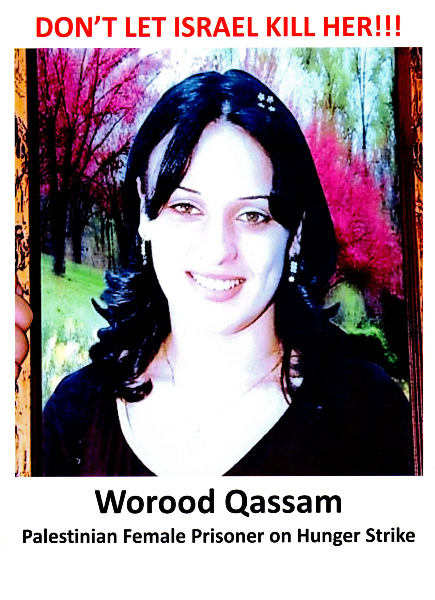 And as even more cruel punishment, this 6 hours can occur at any time within that 24 hour period, day or night, morning or middle of the night, always at israel’s discretion. 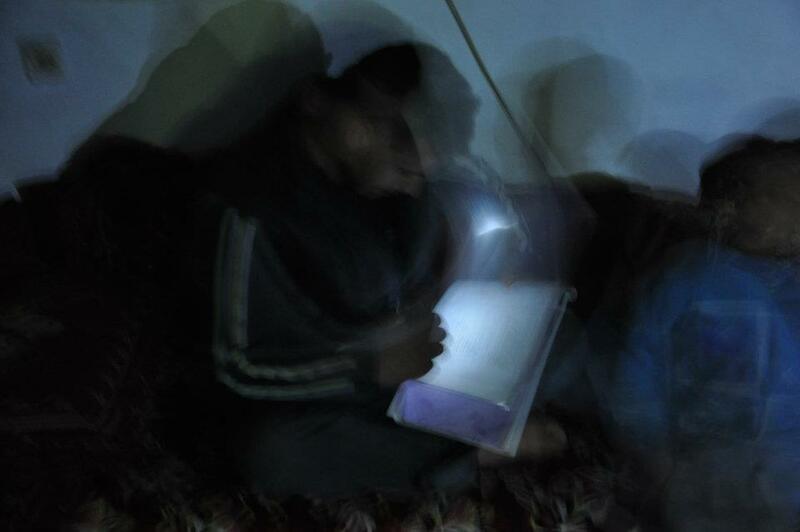 This is done to demoralise the Palestinians even more, so that they cannot plan for anything in their lives with any assurance that they will have electricity available. It’s all about keeping them suffering, always keeping Israel in control of most aspects of Palestinians lives, making sure the people of Gaza are unable to control even the simplest of activities in their lives, like when they can flip a switch and a light comes on, or when they use a washing machine, or when they can charge their computers or phones, or when their children can study or play. For those who can afford it, tiny Generators and candles are what they mostly rely on. So night after night as we returned to our hotel, we climbed the 5 flights of stairs, usually in darkness, up to the top floor Cafe which seemed to have generator power most nights. We came in search of an internet signal, or a cup of tea, or just to unwind and digest the realities of what we had witnessed that day. So we often sat on the top floor café which is an open space with a balcony which faces the ocean and the Gaza seashore which was in front of us. As you stand on the balcony and look across the darkness, the most amazing fact will hit you, as you stand there in Gaza and look across the water, you can, within a matter of minutes see the entire desperate sad story of Palestine encapsulated into one glance across the ocean. And, what will strike you the most about Palestinians, is the smiles on their faces, and that they have nothing and yet want to give what they have to you to thank you for just visiting them, for just validating their story, and their existence. Because that is what this is really all about, Even the smallest child knows what the real battle is about, it’s the land, it’s always about the land, their land, their existence. They are fighting so as not to become a people without a land, they are fighting for their very existence in this world. We must all redouble our efforts to help them in this noble fight for their existence! My Dear friend Mags O’Brien (SIPTU & TUFP and Irish Ship to Gaza comrade) who lives in Dublin contacted me around the beginning of March 2012 just before UNISON’S International women’s day festivities which would be held on March 8th 2012 in Belfast. She said that a quilt had been made by women in Ireland who were members of the trade unions and they wanted it delivered to Gaza, was I up for doing it. I said “yes!” and agreed to meet her in Belfast on 8th of March for International Women’s day. March 8th arrived and I boarded the bus form Derry as Mag’s boarded the bus from Dublin. I was excited about the prospect of delivering this message of love and solidarity to our sisters in Gaza. As I was already planning to travel out to Gaza on March 28th, delivering the quilt on behalf of Irish women could easily be added into my schedule. We both arrived in Belfast and attended the woman’s day march and speeches after. During the speeches I couldn’t help but think to myself “here we are in Ireland as women standing free, exerting our rights as women, marching for what women have achieved and what women will achieve as our struggle continues to move forward” yet, back in Gaza our sisters are struggling in a way many of us here cannot comprehend. See for yourself the reality of life in Gaza for poor women who have lost their homes and/or husbands in Cast Lead. Barely enough room for one person let alone ten!! Women with children forced to live in refugee camps, in tiny 3 metre areas that more resemble a stable or a shed rather than a inhabitable home created by a brutal inhumane collective punishment siege! 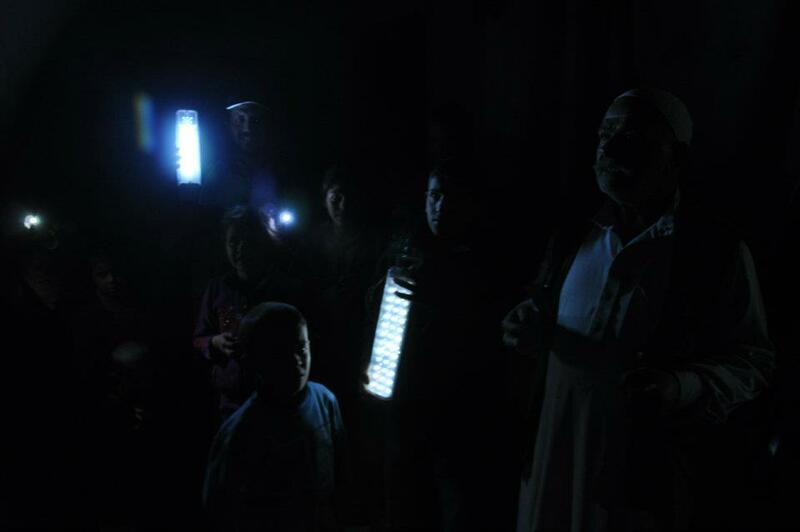 Women who have had to watch their homes destroyed in a flash of white light from Israeli drones or F-16’s. Women who have had to watch their own children die for lack of medical supplies, or parts, and still others have been forced to watch as their child lies dying needlessly before their eyes, simply waiting for a little permit to be approved by Israel for the child to leave Gaza to go to a specialist hospital in Egypt or Israel. Women who have lost their homes and their husbands in Cast Lead and are now left to fend for themselves in the streets of an open air prison. The refugee camps will haunt you, cramped and filled with women and children, so many children. With horrible sewage problems because Israel won’t allow pipes in to fix the bombed out sewer system. The smell of this is a constant reminder and it is never far away, even the sea is polluted with sewage, and the tap water is nothing but contaminated sea water with waste in it. This is life in Gaza, this is a man made disaster of epic proportions which is being ignored by most of the world. And the women are suffering the most. So I was very happy to facilitate this Quilt with a message of Solidarity to our sisters in Gaza from women in Ireland. The quilt was sponsored by UNISON and in 2011 it was taken from Belfast in small pieces down to the Women’s Seminar in Cork where women began working on it. The Quilt was then brought back up to Belfast where the finishing work was carried out by Vivien Holding of the Communications Workers Union. Vivien put it together and laboriously sewed the binding and backing. Mag’s and I met up with Patricia McKeown the Regional Secretary of UNISON in the North of Ireland who facilitated us in making our way to the UNISON building for the remainder of the day’s events and speeches. As we made our way to the UNISION building we discussed with Patricia the possibility of Irish women doing some solidarity work with our sisters in Gaza. From the quilts idea and inception by women in Belfast shortly after Cast Lead, the quilt began its life in Belfast, travelled down to Cork where more women worked on it, then it travelled back to Belfast where still more women completed it. The quilt has travelled across Ireland, then by air across England, France, Italy, Greece to Cairo, Egypt. Where it then began the 7 hour ride across the Sinai desert where on March 28th it crossed into Rafah, Palestine, and then travelled to Kahn Younis where it was received and presented to Widyan Sha’at the Director of Ethar Woman’s Initiative. It is home now. Sinead MacLochlainn made the presentation on behalf of the the Women’s Committee Irish Congress of Trade Unions’ and a mention of the ICTU, NIICTU, UNISON, UNITE, Communications Union Workers as well. Ms. Sha’at speaking on behalf of Ethar Initiative said she wishes to thank the women of Ireland for their solidarity, especially Taryn Trainer and the Women’s Committee in the North, Pauline Buchanan of ICTU and Patricia McKeown of UNISON and Vivien Holding of the Communications Workers Union. The quilt will stand as a reminder to women here in Gaza of the friendship and solidarity between Ireland and Palestine. The Ethar Initiative will be sending a personal letter of thanks to the ICTU/NIICTU and to those organisations and women who participated in this project of solidarity by creating and sending the Quilt to Gaza. The Ethar Initiative was set up by women, for women, and is run by women who get no salary, all donations go to the poor women and children that Ethar helps. Ethar is a labour of love run by our sisters, who need our help!! So, please check back on this website as we will be doing an entire report on the Ethar Woman’s Initiative and we hope all the women of Ireland will get on board and get invovled with the campaign to help woman in Gaza by working with our sisters at Ethar. Coming soon in solidarity we will be launching an all Ireland Initiative for women to work with our sisters in Gaza dubbed the “Ireland Gaza Woman’s Initiative ” and we hope Irish women will join us in working directly with our sisters in Gaza! Bookmark our coming website here http://www.igwi.org and check back to learn about the new Initiative between Ireland and Gaza. Kudos to the Irish! They know from first hand experience what oppression is and have been fighting against it for decades. Finally, one of the biggest aggressors responded with an accusation claiming that Ireland is the most hostile country in Europe …. Hatred of Israel reaches new levels in Ireland: An outrageous anti-Israel display was held over the weekend on Dublin’s main pedestrian street, presenting IDF soldiers as Nazi troops. As part of the display, sponsored by the Dublin City Council, a group of pro-Palestinian activists set up a model of the separation fence and an IDF roadblock. The activists dressed up as soldiers and beat, humiliated and pointed their weapons at other activists dressed as Palestinians, in front of thousands of Irish citizens and tourists. The officials voiced their concern that the pressures would lead to the cancellation of the Israeli film festival. 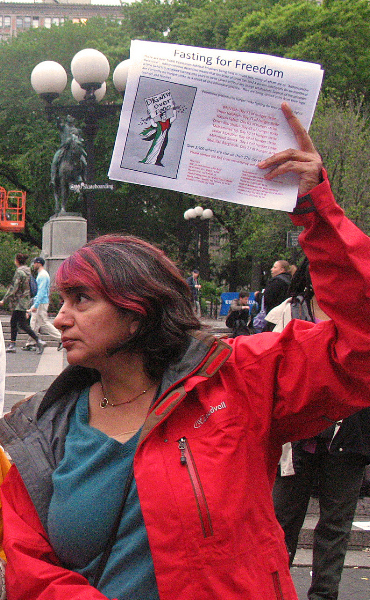 Criminals treating humanitarian aid activists as criminals? THAT IS CRIMINAL! BETHLEHEM — Activists detained in Israel after they attempted to sail to Gaza are refusing to sign a deportation agreement, a spokeswoman for the group said Sunday. The document states that they entered Israel voluntarily and in an illegal manner, which the imprisoned boat passengers dispute, Huwaida Arraf said in a statement. Their refusal to sign the deal, which would see them deported immediately, means they will be held for 72 hours before an Israeli immigration judge reviews their deportation, Arraf added. The Irish-flagged Saoirse (“Freedom”) and the Canadian ship Tahrir (“Liberation”) — carrying 27 activists and reporters from nine countries — were intercepted by Israeli naval commandos in international waters off the Gaza coast and taken to Israeli port Ashdod on Friday. Israeli Interior ministry spokeswoman Sabine Hadad said on Saturday that six passengers had been released and the remaining 21 people were still being held at a detention facility in Ramla near Tel Aviv. Coordinator of the Irish ship Fintan Lane said Israeli forces used high-pressure hoses to take over the vessel, and caused a collision between the vessels, in a telephone call made to boat organizers from jail on Sunday. Greek captain of the Tahrir Giorgos Klontzas, since released from jail, told Greek Omnia TV that Israel forces handcuffed him tightly and stuck fingers in his eyes during interrogation. The Israeli military said no one was injured in the operation to block the ships from reaching Gaza, under a tightened Israeli blockade since Hamas took power in 2007. The Israeli military maintains a land and maritime embargo on the coastal enclave of 1.6 million people, which international organisations criticize as “collective punishment,” in breach of the Geneva Conventions. 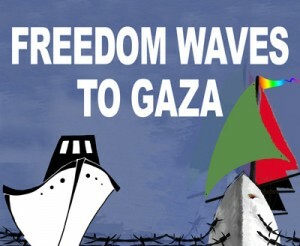 Activists organised a major attempt to break the Israeli blockade in May 2010, when six ships led by the Turkish Mavi Marmara tried to reach Gaza. Israeli troops stormed the Marmara, killing nine Turkish nationals and sparking a diplomatic crisis with Ankara, which expelled the Israeli ambassador and has cut military ties with Israel. Earlier this year, a second flotilla tried to reach Gaza, but several ships were sabotaged at port. Activists — who blamed the disabling of the ships on Israel — kept this week’s voyage under wraps until they set off from a southern Turkish port on Wednesday to avoid similar attempts, they said. 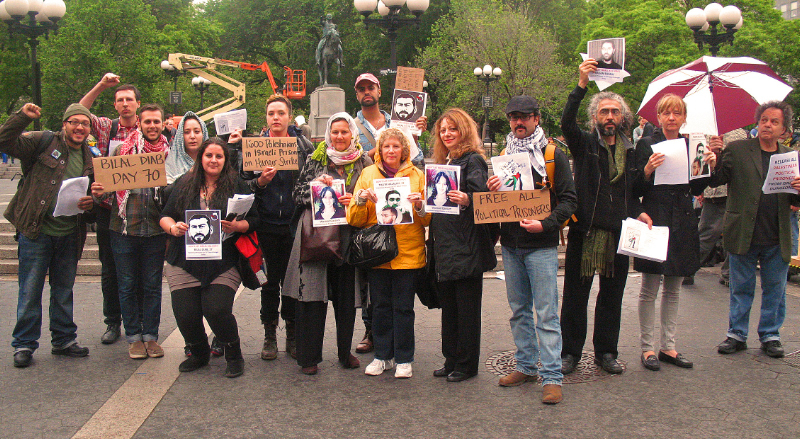 * Majd Kayyal was released, but it appears David the other political prisoners weren’t told where he was taken. LONDON, ON – A Canadian man aboard a Gaza-bound vessel was apparently beaten and injured when arrested by Israeli authorities when it was intercepted Friday, a colleagues says. Israeli authorities on Saturday began deporting pro-Palestinian activists who tried to breach the Jewish state’s naval blockade of the Gaza Strip. David Heap, Peace and Social Justice chair for the London chapter of the Council of Canadians, is still in custody at Givon prison. Heap also sits on a steering committee with People for Peace, London and teaches French studies and linguistics at the University of Western Ontario. 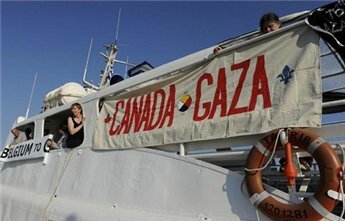 The Israeli navy on Friday intercepted a Canadian vessel and an Irish boat carrying 27 activists and medical supplies which had set sail from Turkey toward the Gaza Strip. Wendy Goldsmith, of People for Peace, said the boat was intercepted 30 miles from the Gaza coast in international waters. “Our folks peacefully refused to leave and they were violently taken off the boat and beaten but I don’t know the extent of their injuries,” Goldsmith said. Goldsmith said she’s “really concerned” about the protesters and, especially, Heap, who has made other trips to Gaza, most recently in July when the boat he was on was seized by Greek authorities and towed back to port. An Israeli Immigration Authority spokesperson said two Greek citizens were flown home on Saturday and two journalists – one American and one Spanish – were to board flights on Sunday. One Israeli citizen was released, as was an Egyptian woman who had crossed back to neighbouring Egypt overnight, the spokeswoman said. 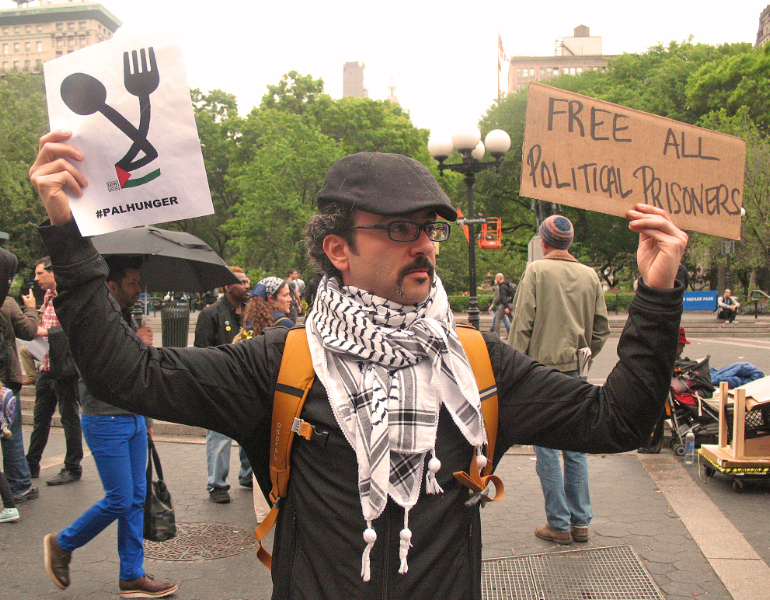 Twenty one other activists were being held in custody in Israel and were awaiting deportation. There were no injuries in the interception of the two boats on Friday, according to officials. PICTURED BELOW IS THE MV SAOIRSE AS IT WAS BEING LOWERED INTO THE WATER TO SAIL TO GAZA, ISN’T SHE LOVELY, SAIL TO GAZA SAOIRSE!!! “To the Israelis. I say – You will not stop the Irish! We will break your siege! Speaking to day as the ships entered International Waters Councillor MacLochlainn said. “I send greetings to my comrades aboard the MV Saoirse as it takes to the seas on its heroic voyage to smash the illegal Siege on Palestine.“I am unable to travel with the ship on this occasion although I was aboard last time when Israeli forces sabotaged our vessel. We pledged then that we would repair our ship and complete our journey. WE have done this and the ship set sail today along with a Canadian Ship and it is expected that they will reach Gaza waters in about 48 hours or so. “Israeli forces have promised to do whatever they see fit to prevent them landing in Gaza. A few months ago they sabotaged our boat in a way that could have killed many of us, before that they murdered 9 innocent aid workers aboard a Turkish aid ship. We cannot but worry about our fellow citizens on this voyage. “I call on the Irish Government to contact the Israeli regime immediately and tell them not to interfere with Irish citizens on the high seas and to lift their illegal siege of Gaza. I ask others to join me in this call on our Government to defend our citizens. Cllr Gerry MacLochlainn has travelled to Gaza on many occasions and will be visiting Gaza later this month. He as a member of the International Steering Group For Freedom Flotilla 2 and was a passenger on the MV Saoirse when it was sabotaged in Turkey a few months ago. 1st video released just prior to sailing. MV Saoirse, Ships engineer, Pat Fitzgerald talks of the prior sabotage and repairs and the mission to sail to Gaza alongside the Canadian boat. We will not be deterred from sailing to Gaza. fully repaired, we are now on the way to Gaza!!! Hello frıends and comrades as you all know we attempted to saıl to gaza some months ago! our shıp was sabotaged and was damaged ın such a way to try and kıll everyone on board our shıp. They dıd not succeed!!! Israel is very wrong ıf they thınk they frıghtened us, if anything ıt has made us more determined to get to Gaza. There are 1.5 mıllıon people sufferıng ın gaza, and lıttle chıldren are beıng bombed every day. Pat Fitzgerald, Engineer on board the MV Saoirse and a veteran seafarer for over two decades tells the full story about the damage to Saoirse at Gocek and that it could not have been anything else but sabotage. Still another boat bound for Gaza was sabotaged last night,undoubtedly by thugs working for the Israeli government. Activists are sure that Israel is to blame for causing damage to Irish ship ‘Saoirse’ (Gaelic for freedom), which was slated to carry some 20 activists. The damage, if gone undetected, could have resulted in the loss of many lives. Another report regarding this criminal act will be posted later this morning after a press conference is held by the activists involved. A demonstration is also being organised for later today. Israel’s hysterical overreaction to the Freedom Flotilla 2 Stay Human initiative has not intimidated hundreds of brave people who are determined to challenge Tel Aviv’s illegal siege of Gaza. They are gathering on a number of boats in several European ports ready to take humanitarian aid to the beleaguered Palestinian people. The amount of aid that they intend to deliver to Gaza will not affect the level of Palestinian deprivation significantly, but it will be of crucial importance. The presence of campaigners from organisations in around 20 countries will remind the Palestinian people that they are neither alone nor forgotten. And the international publicity generated by the flotilla and how Israel reacts to it will fuel ever-growing numbers of humanity to take up the Palestinian cause. Israel relied on the iron fist in May 2010, sending in its elite commandos to assault the Turkish aid vessel Mavi Marmara, opening fire as they abseiled onto the ship from their helicopters. Not content with killing nine supporters of the Turkish IHH aid organisation, the Israeli forces beat and robbed other peaceful campaigners. They also enforced a news blackout before putting out their own doctored film coverage, complete with obligatory anti-semitic comments, including references to nazi death camps, said to have been uttered by the pro-Palestinian activists. Israel’s refusal to return film recordings and mobile phones is eloquent testament to the reality of what took place. The Netanyahu government’s dirty tricks department has been at it again, trying to misrepresent the mission and the motives of those taking part. Freedom Flotilla 2 Stay Human has conducted non-violence resistance lessons for participants and insisted that there should be no violent responses to any assault on their vessels. However, Israel has tried to ratchet up tension by claiming to have “intelligence assets” inside the flotilla who have identified individuals intent on using “chemicals” against Israeli troops. However, not too much credence should be given to these claims in light of Israel’s record last year and the bizarre claims this week by “US gay rights activist” Marc Pax, who said that he had been denied a place on the flotilla because of his sexuality and to have then discovered that Hamas is behind it. The same goes for the Israeli government’s threat to confiscate journalists’ equipment and ban them from Israel for 10 years if they accompany the flotilla. Only when the Foreign Press Association in Jerusalem condemned this “chilling message” as raising questions about Israel’s commitment to freedom of the press did Netanyahu surface to deny that this was government policy. It probably isn’t official government policy to sabotage the propeller shaft of a boat in Piraeus harbour taking Greek, Swedish and Norwegian passengers to Gaza, but it happened. The US boat Audacity of Hope was also delayed after Israeli legal group Shurat HaDin told the Greek authorities that the boat wasn’t seaworthy, necessitating a time-consuming inspection. But ships are already sailing towards Gaza, including the Irish vessel Saoirse, and two French boats. The only European Union member state officially backing the flotilla is Ireland, but every country has a responsibility to protect its own citizens and defend international law during this forthcoming challenge to Israel’s lawlessness. Last Sunday close to 300 people participated in the 10K sponsored run from Lisburn to Belfast City Centre for the Irish Ship to Gaza. Runners from all walks of life braved the cold Irish weather to make a clear statement to Israel the Irish people say “The illegal Siege must be lifted” and we will see Ireland at the forefront when the siege is broken by sea. The Irish Ship to Gaza campaign wishes to thank all those who made this event such a big success with special thanks to John Mallon, Philomena Flood, Michele Garrett, the stewards who did a great job on the day and the rest of the Belfast and Northern fundraising team! Such an overwhelming site to see entire families decked out to run, several schools sent teams including Colaiste Feirste, who won for the first team across the finish line. Trophies were awarded for 1st male, 1st female, 1st school, 1st team and also for the most support and effort. Young, old and in between all took part, we especially thank all the physically challenged people who participated. Everyone had one thing in common, to help make sure Ireland is represented with its own ship in the Freedom Flotilla 2 and fair play to those from Armagh and Downpatrick for coming up to run in this event. The professional runners began arriving at the finish line only 27 minutes later with the winning time of 27 minutes 10 seconds! This was followed by the fun runners and walkers later on. Special thanks to Lilly Mulholland owner of Kelly’s Cellar who graciously opened Kelly’s up for free Irish stew, sandwiches, tea and coffee for everyone after the race and who personally donated £60.00 to the ISTG campaign as well. The results are below along with photos of the presentations. Aoibhe Clarke a tiny supporter who was carried across the finish line by her mum. Aoibhe says let’s get this ship in the water!! 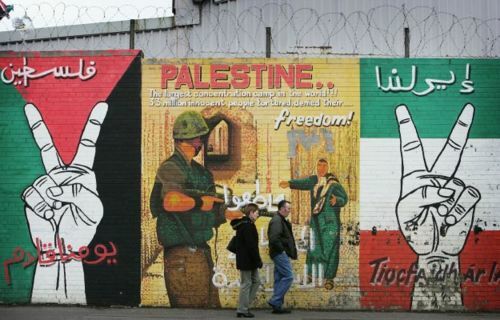 PEACE TO GAZA FROM IRELAND…. When the call went through, everyone smiled. St. Mary’s College had successfully linked up, via live video, with a girls’ primary school in Abasan al-Kabera in the Gaza Strip. “Salam Gaza,” said the St. Mary’s girls. “Salam Derry,” replied the girls from Abasan Primary School. Organised by Mr Stephen Crockett (St. Mary’s College teacher) and Mr. Patrick McCourt (St. Joseph’s School teacher), of the Derry Friends of Palestine’s Educational Committee, the event was set-up as a cultural exchange. It was a remarkable exchange of ideas, stories and songs. Everyone in the room was struck by how both schools mirrored each other. As Stephen Crockett encouraged his students to speak up, minutes later, so did Gazan teacher, Mrs. Nisra. As the St. Mary’s IT technician instructed the girls to look towards the camera, so did his Gaza counterpart. The Year Eight pupils of Class A16 at St. Mary’s were given a classroom and all the equipment required to make the live link-up possible. However, because of the continuing Israeli blockade imposed on the Gaza Strip, the girls from the Abasan primary school had to travel to the local university to take part. St. Mary’s began their performance with a wonderful solo rendition of ‘Ag Críost an síol’ and it was, in turn, met with applause from the young Gazan girls. Soon after, several St. Mary’s students conducted two simple science experiments. Again, because of the Israeli blockade, the Gazan girls were unable to return the favour because the apparatus required is not allowed to be brought in to the Gaza Strip. The Derry students continued with a short but impressive presentation on Bloody Sunday. The Year Eight pupils explained what happened on January 30, 1972 and relayed the importance of what happened recently in Guildhall Square when all 14 people who died as a result of Bloody Sunday were declared innocent. Perhaps the most impressive part of the St. Mary’s performance was the finale. The award winning school choir sang parts of ‘Danny Boy’, ‘The Fields of Athenry’ and ‘I’ll Tell Me Ma’. The Gazan girls loved what they they were hearing and clapped again and again. After St. Mary’s had finished, a little 12-year-old girl from the Abasan school was introduced and, on her own, sang an exquisite Arabic song about the famous Al-Aqsa Mosque in Jerusalem. The little girl’s performance was so emotive that it brought Sinead MacLochlainn (Derry Friends of Palestine – Chairperson) to tears. “I have visited the Gaza Strip before and you come away feeling that the people there are tremendously isolated,” she said. “This is one of the reasons why our Educational Committee organised this event. Ahmed Alnajjar (Ministry of Education & Higher Education – Gaza) helped to coordinate the event in Abasan. He praised both St. Mary’s College and the Derry Friends of Palestine for their support and added that they hope to stay in contact. Mr. Alnajjar made sure to add his support to the findings of the Saville report. 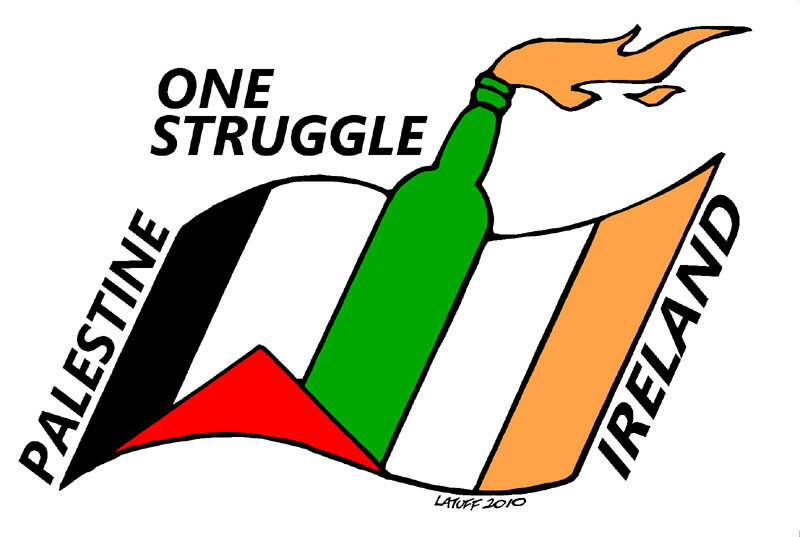 “We, the people of Gaza, have a lot in common with the people of Ireland. When he heard about the Saville report last week, the people of Gaza rejoiced,” he said. Mrs Lena McMorrow, Vice Principal of St Mary’s College, described the event as exciting and one which they hope to repeat again. Twelve-year-olds Emily Crawley and Caitlin Quigley both took part in the video exchange. On 15 June 2010, the people of Derry were waiting with great anticipation for the long awaited Saville report to be released. The town was filled with people, thousands gathering and assembling at the Guildhall Square and overflowing down to Williams Street and up Shipquay Street waiting for the Truth to be Set Free. It was as if the whole town was “one” That day. The cheers spread across the crowd in all directions. A short time later the families emerged victoriously, with cheers of “Innocent” ringing from the Guildhall steps. I remember the faces of people in the crowd, a day I will never forget, there were cheers, tears and joy in Derry that day. I thought of the poor family members who fought for the truth to be set free for so many years, yet who had passed away never having the chance to see this day come. I noticed someone in the crowd was flying a Palestinian flag, and I found myself thinking of the hundreds of innocent Palestinians murdered, and wondered would their truth ever be set free. And I thought of how many Bloody Sunday’s, Monday’s, Tuesday’s, Wednesday’s, Thursday’s, Friday’s and Saturday’s they have suffered for so many years. As the Truth was finally set free in Derry, and as each Bloody Sunday family member spoke of their murdered loved one, followed by the word “Innocent!” we all stood and cheered as one. But we were more than one that day. As people in our little corner of the world were rejoicing at the coming of a day they had dreamed of for 38 years, yet far away in Palestine, others were also affected by our victory that day. In our sister town of Khan Younis the news spread about what was taking place in Derry. It was soon decided that an official celebration for the people of Derry should be organized, so that the people of Khan Younis could show their solidarity in our long awaited victory, a victory they also have dreamed of, with regard to their own innocent civilians who have been murdered by their occupiers and oppressors. And so it was that on 22nd June 2010, the people of Khan Younis came out in a show of solidarity for Derry. Hundreds assembled in front of the Khan Younis Municipality Building, a place that has fond memories. As I viewed the photos of the day’s event, it was almost overwhelming. To see the people of Khan Younis holding the placards of those faces we know only too well here in Derry, the 14 murdered on Bloody Sunday, this illustrated what our victory in Derry meant to others around the world, it represented “hope” that their day of truth would one day come as well. And this was voiced so eloquently in the speech given in Khan Younis that day, a copy of which is provided below the video. I am very pleased to speak on behalf of the people of my city Khanyounis and all the Palestinians inside Palestine and the Diaspora to extend our hearty congratulation to and support for the people of Derry and all the Irish people on the release of the Final Report of the Bloody Sunday Inquiry. Though it is said: better late than never, it is still very sad that justice took 38 years to be served in Derry. On this historic day, the city of Khanyounis shares with Derry and the families of the martyrs of Bloody Sunday happiness that their beloved heroes were declared innocent. We call upon all humanitarians and people concerned to exert all their efforts to bring the murderers to justice and specially Brigadier General Robert Ford who was the one to give orders to kill. It is not only Ford and his soldiers that should be charged, but all those who committed the massacres in Derry. All the soldiers that have committed atrocities against Palestinians and the people of Gaza should be charged for their crimes against humanity. Bloody Sunday brings to mind Black Sunday in 1990 when 6 Palestinian workers were slain by the hands of a criminal Zionist who opened fire on them while trying to find work to sustain their offspring. This event also brings to mind the Balfour declaration that resulted in the suffering and misery of our Palestinian people after he promised a home for the Zionists on our land in 1917. We take this opportunity to call upon the present British Government to apologize to the Palestinian people for the agonies resulted from this promise. The people of Derry and Ireland have stood steadfast and in solidarity with the people of Gaza and all Palestinians that live both inside and outside of Palestine. For the struggles you have endured in the past are similar to those that Palestinians continue to face today. 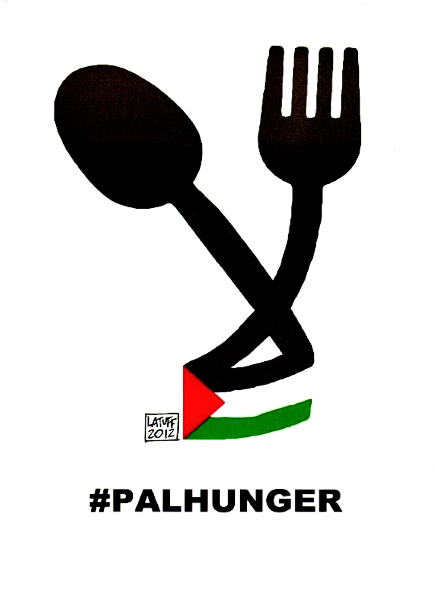 A humane and just world implores that all concerned humanitarians from the Irish to Palestinians, from Ireland to Gaza, and from all over the world, join together in the struggle against injustice, suppression and the innocent killing and massacre of people. Derry and the Irish have aided the people of Gaza since the Israeli massacre of Palestinian women, men and children. The aid and, more importantly, the support given will be forever remembered in the hearts and minds of Gaza’s wee ones, as well as the old. Like the martyrs of Bloody Sunday, one day the martyrs of Palestine including Palestinians and Internationals will be vindicated and commemorated worldwide. They will be forever remembered for their heroic actions because the voice of the voiceless will not be relent until injustice is reversed and justice is prevailed and until the Gaza siege has been completed lifted and a Palestinian state declared. Irish government offers MV Rachel Corrie ship to divert to Israeli port of Ashdod instead of Gaza; Foreign Ministry: Israel doesn’t want a confrontation with the Gaza-bound ship. Passengers on board the MV Rachel Corrie ship have rejected a proposed agreement made between the Israeli and Irish governments to divert the ship to the Israeli port of Ashdod instead of the coast of Gaza. Following the passengers’ rejection of the agreement, the forum of seven high ranking ministers decided to go ahead with the plan to stop the ship and take it over, as was done with the previous Gaza flotilla. Over the last few days the Foreign Ministry has been trying to come to a diplomatic solution with the organizers of the ship, under the Irish government’s mediation. During negotiations, the ship’s passengers emphasized that they were willing to undergo a security check by the Israel Defense Forces in the ocean to verify there were no weapons on the ship, but demanded they then be allowed to pass to the coast of Gaza. Israel refused, and demanded the security check take place in the Ashdod port and that the ship’s cargo would be transferred from there to the Gaza Strip, under the supervision of passengers and Irish diplomats. Ireland’s Minister for Foreign Affairs, Micheal Martin, issued a statement on Friday on the failed agreement. “On Friday morning, an understanding was reached with the Israeli government whereby the Rachel Corrie would have approached the Israeli exclusion zone before accepting diversion to the Israeli port of Ashdod. At Ashdod, the cargo would have been unloaded and inspected under the supervision of UN and officials from the Irish Aid Division of my Department. “The entire cargo, including what is understood to be 550 tonnes of cement, would then have been transported to Gaza. Two persons from the Rachel Corrie would have been permitted to accompany the cargo to the Israeli border crossing into Gaza at Erez. “In my view, such an arrangement would have offered a useful precedent for future humanitarian shipments, pending the complete lifting of the blockade,” he said. 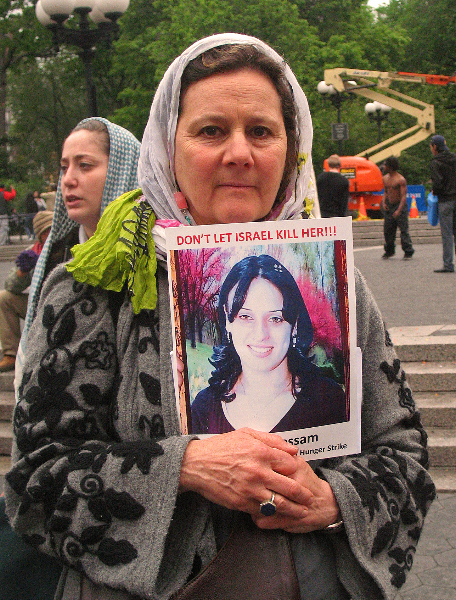 He also called on Israel to refrain from using force on the passengers of the Rachel Corrie ship. Israel’s Foreign Ministry issued a statement on Friday emphasizing that Israel does not want a confrontation with the Gaza-bound ship the MV Rachel Corrie. “We have no desire for a confrontation. We have no desire to board the ship. If the ship decides to sail the port of Ashdod, then we will ensure its safe arrival and will not board it,” said the Foreign Ministry Director-General Yossi Gal. The MV Rachel Corrie is headed directly for the Gaza Strip with hundreds of tons of humanitarian aid and is expected reach Israel’s 20-mile exclusion zone within the next day, a spokesman for the pro-Palestinian group organizing the mission said on Friday. “Israel is prepared to receive the ship and to offload its contents.After an inspection to ensure that no weapons and war materials are on board, we are prepared to deliver all of the goods to Gaza,” the Foreign Ministry’s statement read. The Foreign Ministry’s statement was issued following a discussion between the ministers of the forum of seven on Friday afternoon in Jerusalem. The statement seems to hint that Israel’s attempts at coming to a resolution with the ship’s passengers have reached a dead end. According to a government source in Jerusalem, Prime Minister Benjamin Netanyahu instructed the foreign ministry’s director-general Yossi Gal to invite the foreign press and to issue the statement, in order to make Israel’s stance perfectly clear to the ship’s passengers and to the international community. The MV Rachel Corrie had initially planned to reach the Gaza Strip sometime this week, despite an Israel Navy raid on the first six ships in the humanitarian aid convoy on Monday that left nine people dead and several more wounded. Despite reports that the 1,200-ton ship was heading back to Ireland due to technical difficulties involving its two accompanying vessels, Free Gaza Movement spokeswoman Greta Berlin said the ship was on schedule and had no plans to stop in any port along the way. Free Gaza’s legal adviser, Audrey Bomse, earlier Friday said that the ship was planning to return to Ireland in the coming days due to Israel’s “sabotage” of the two passenger boats meant to carry journalists. Bomse told Army Radio that the vessels sustained such serious technical damage while docked in Greece last weekend that they would not be able to sail for weeks. Bomse was quoted by Army Radio on Friday as saying that the ship would only attempt to breach the Gaza blockade once accompanied by the two passenger vessels. She also said that the activists would refuse any diplomatic solution offered by Israel. The legal adviser reportedly told Army Radio that her movement’s goal was not just to bring aid to Gaza, but to send a message to Israel. Activists would not stop sending these ship to Gaza until Israel agree to lift its blockade, the radio quoted Bomse as saying. 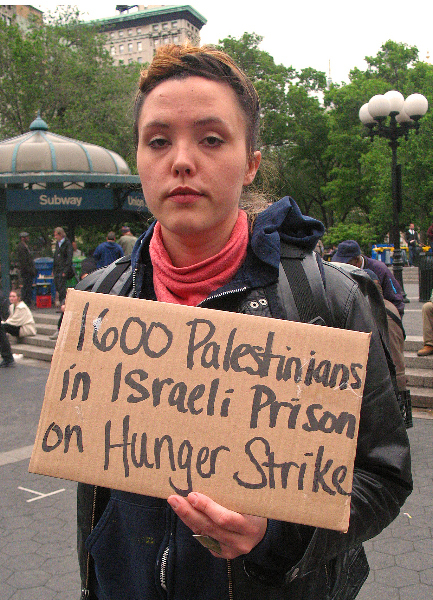 The Rachel Corrie’s trip to Gaza is sponsored by two non-governmental organizations, from Ireland and Malaysia. On board is Irish Nobel Peace Prize laureate Mairead Maguire and former United Nations deputy secretary-general Denis Halliday. Also on board are Malaysians from a group sponsored by the former prime minister of Malaysia. The ship was to have been part of the flotilla that was stopped at sea early Monday morning, but was delayed due to the technical problems. Its cargo includes cement and medical equipment such as a tomograph (CT ), as well as toys and printing paper. On 10th April, the Derry Friends of Palestine held our first sponsored “Climb for Palestine” of Mount Errigal in beautiful Donegal. And what a success it was! We are very thankful for all the support people have given us and for all those who made the climb, collected the money and enjoyed the day of climbing and the night of great craic at the cottage. After the prior week of snow, rain and general horrible weather, the Palestinian Sun God cleared the rain and parted the clouds in Ireland, the day was sunny, warm and perfect for the climb ahead. The group assembled at Templemore Sports Complex at 10AM, and after photos behind our new banner, the convoy of vehicles headed for Donegal. After the drive to Donegal, soon everyone arrived in the parking lot and more photos were taken before the long climb to the top of Mount Errigal, shown in the background. Beginning the climb up the mountain and enjoying the scenery along the way. Finally everyone makes it to the top. Everyone celebrates and takes turns posing with the Palestinian flag on the summit of Mount Errigal. The views are beautiful and people rest and enjoy the scenery before going back down the mountain. After the climb down everyone headed to the cottage for a traditional session and a few jars, the craic was ninety! And as the sun set on the Palestinian flag outside the cottage, the craic went on till the wee hours as we thought of the day Palestine will be free! All of us from Derry Friends of Palestine wish to thank everyone who participated in the “Climb for Palestine” and for making this fundraiser a big success. We look forward to your continued support as your donations will help us as we begin working on our next big project for Palestine. We have many more photos of the climb AND videos!! Visit the gallery HERE.